Origin and Habitat: Transkei, Natal, Northern Transvaal from the dry river valleys of the eastern Cape (where it is often dominant) through KwaZulu-Natal, and into Northern provinces. Habitat: It grows on dry flatlands and north-facing rocky slopes in bushveld and savanna-thicket, often in dense stands and dominant over large areas. 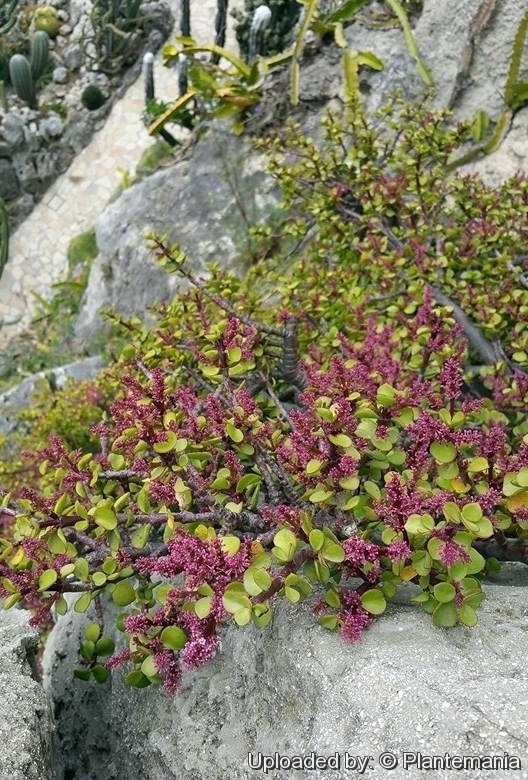 Elephant relish the juicy, succulent leaves, of the plant and can cause such browsing pressure that the species man become limited to rock-cliffs and other out-of-reach places. 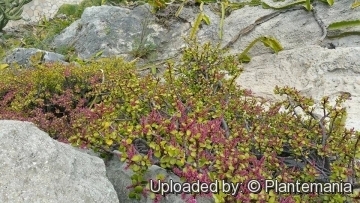 Description: Portulacaria afra (Elephant's food or Dwarf jade plant) is a handsome little succulent tree, in dry regions, where it is also a valuable fodder plant. In cultivation it often remains a decorative small shrub with small round fleshy leaves carried on red stems. 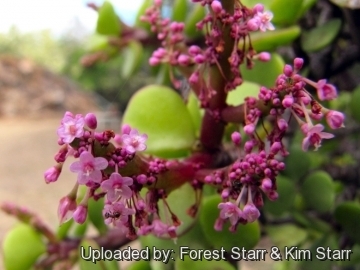 Tiny pink flowers appear in summer. 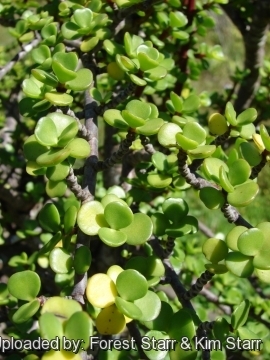 Portulacaria afra sometimes is confused with Crassula ovata (Jade plant) because the plants look alike, but portulacaria leaves are smaller and the stems are wiry. 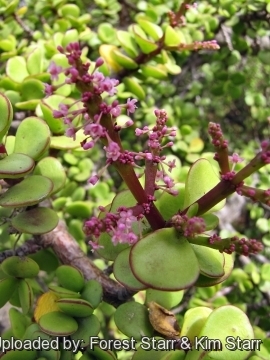 Habit: It is a medium-sized succulent shrub, or small soft-wooded tree, 2-5 meters tall with a few main trunks and numerous side branches. A dwarf, pendant form is available. Portulacaria afra f. variegata has a prostrate growth habit and yellow-variegated leaves. Stem: Jointed. Main stem(s) green when young, latter becoming greyish-brown with prominent leaf scars. Bark reddish-tinged. Leaves: Evergreen or deciduous, opposite, situated along reddish stems, broadly elliptic to rounded (20-30 x 11-18 mm). bright green, thick and fleshy with a sharp point, margin entire, petiole absent. Flowers: Up to 2 mm in diameter, pale pink to purplish, produced in small many-flowered clusters at the ends of branches, pink. Sepals 2, persistent. Petals 5, pink, persistent. 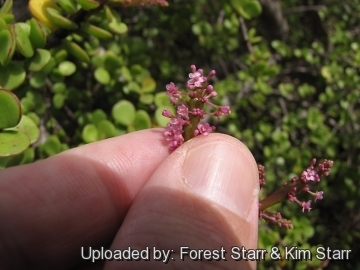 Blooming season: When drought stressed and given full sun, portulacaria produces sprays of tiny purple blooms. Mostly from spring to summer. Fruit: Small narrowly 3-winged capsule ± 5 mm long, indehiscent,1-seeded. 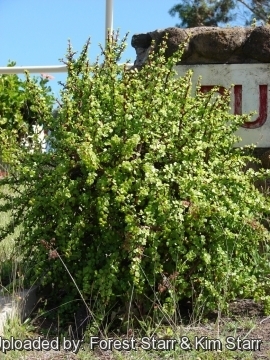 5) Portulacaria afra in: Journal of the Cactus & Succulent Society (US) 45(2): 71 (1973). 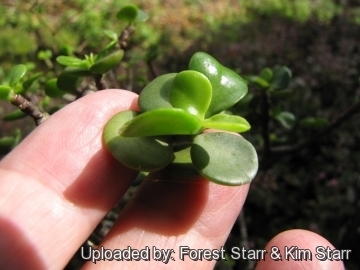 10) Forest & Kim Starr “Portulacaria afra (Miniature jade plant, purslane tree)”. Plants of Hawaii. <http://www.starrenvironmental.com>. 23 Nov. 2014. 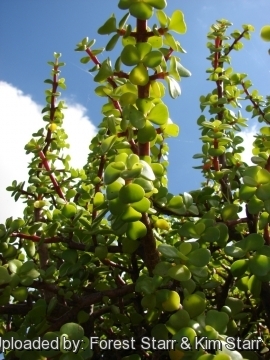 Cultivation and Propagation: Portulacaria afra is a much decorative succulent for arid climates. It is a summer grower species that offers no cultivation difficulties. It is quite happy in the hottest, driest spot in the garden. It can be overwintered outdoors if sheltered from frosts. Soil: It adapts to most soil types, preferably not too heavy in texture; good drainage is desirable. Waterings: It is extremely drought tolerant; A deep soaking once a month in the summer will keep the plant looking good. For pot culture in summer, during the vegetative period, it must be regularly watered, but allowing the substratum to completely dry up before irrigating again (but do not overwater ); in winter, it’s to be kept dry. Preferable not to water on overcast days, humid days or cold winter days. Exposure: A location with full sun is best, although it can grow in partial shade. Pest and diseases: Overwatering and poor drainage will damage or kill the plant. Uses: It is suitable for small “desert” gardens, in association with other xerophytes. The plant's form and texture are compatible with other succulents and cacti. Where the open air cultivation is not possible due to the climate, it is to be cultivated in pot in order to shelter it in winter. Food uses: Leaves edible if you aren't spraying with toxic pesticides and eaten by children, and by lactating mothers when their milk diminishes. Also eaten by cattle, goats and game. Other uses: The roots of the trees bind the soil and are used for hedging and to combat soil erosion and are often planted around farmhouses. Leaves that have been dried and ground are used as snuff. Bonsai couture: Plants are tough and malleable, easily handle drastic pruning, and make good bonsai subjects. Propagation: It is easily propagated by cuttings.